Novelution offers our core product suite, the Novelution Research Management System, to research institutions, hand-in-hand with a thorough audit of your data and processes, strategic consulting, and a software development and deployment process through which we will tailor design and implement customized versions of the system to meet the detailed, specific needs of each individual client. Why Electronic Research Administration (ERA)? The general purpose of an ERA system such as NRMS is to provide a centralized database system with integrated software modules, potentially supporting all aspects of research administration. This may include tools for both administrative and research staff, supporting processes from grant & contract proposal development, to pre-award & post-award management, to integrated IRB & IACUC protocol application and management, to varied compliance tracking, to staff, facilities, and resource management, etc. ERA systems are without any doubt the future of research administration. Serious research institutions are either already using ERA systems, in the process of investigating such systems, or will be soon. The question for any serious research institution that is not currently leveraging an ERA system is not whether it should transition to ERA; rather, the question is when and how this will occur. Managing the tremendous amount of data throughout the full lifecycle of a single research project becomes an extremely complex undertaking, and this challenge to research institutions is exacerbated by rapidly changing external (and often internal) requirements and regulations. For institutions with large numbers of research projects underway simultaneously, each carries the weight of those same complexities. Old fashioned approaches typically involve some combination of tracking these projects with paper, email, and ad hoc spreadsheets and databases, such that scaling the research pipeline nearly adds a multiplicative factor to the administrative workload. This becomes an untenable solution, leading to delays that affect the securing of funding opportunities as well as creating compliance risk due to the possibility of human error that could cost an institution significantly. Furthermore, to maintain a competitive position in the changing landscape of peer research institutions, many of whom are taking advantage of ERA systems or moving in this direction, research institutions should embrace ERA to demonstrate to Sponsors and potential researcher recruits that they take research seriously. Sponsoring agencies (e.g. NSF and AHA) have even begun to mandate use of electronic systems for the submission and management of grants. The federally mandated and sponsored Grants.gov website provides an electronic portal for proposal submissions and other electronic correspondence with Federal sponsors. By using an ERA system, these mandated electronic processes with sponsor agencies can be achieved more seamlessly. Achieving administrative efficiency and minimizing the administrative burden on researchers will enhance an institution's researchers’ competitive position among peer research institutions competing for funds. Regarding software features, Novelution offers a unique degree of customization, compared to other ERA vendors. Beyond our core software suite which is already feature-rich, we have the ability to create a fully customized version of our system to fit the distinct workflow needs of each institution perfectly, rather than requiring an institution's team to fit their workflows to the requirements of an existing system intended for general-purpose use. Novelution specifically built our core software with the intention of creating a highly flexible system, so that we could create tailored versions fulfilling the particular requirements of each client. There are essentially no limits to the customization, from fully unique data and reporting requirements to workflow rules and automated email alerts, etc. NRMS implements across-the-board efficiencies, easing the process for researchers to generate applications and significantly improving processing times for new applications and ongoing administrative management of sponsored projects and protocols. With a centralized data system eliminating the need for redundant data entry across departments as well as automated processes and user-friendly management tools, we aim to move projects through our partners' pipelines faster, thereby allowing them not to miss opportunities for new sponsorships. Increasing the speed of administrative departments, increasing the time that researchers spend on research, and reducing the time that researchers spend on administration, will fight the frustration caused by administrative friction. This will increase researcher satisfaction, as well as reduce the cost of a tremendous amount of work effort on the part of administrative staff. Automated validations and processing of complex workflow rules built into NRMS system will enforce data integrity and adherence to compliance, significantly mitigating business risks to our partner institutions, avoiding potentially huge costs. Without such a system, there is much greater risk of human error leading to compliance breach, poor tracking of funds and budgets, inefficient use of resources, failure to renew expiring grants and protocols, and a generally slower process in which fewer research projects can be managed. This could cost research institutions in the form of loss of funding, compliance penalties, legal fees, and reputational damage. Please note: The screenshots and bullet points of high-level features listed in the module description sections below are examples, to provide a general sense of the nature of system features. However, the system is intended to be tailor customized for each client's ideal needs, so this should not be considered a complete feature listing. Moreover, completely new, custom modules can be created, if desired. Sample page from the user profile management module allowing user to manage training and certification documentation. System automatically integrates this information with IRB Module to apply protocol compliance validation for co-investigators and research team members. Also note the left navigation which dynamically shows the appropriate links based on the logged in user’s authorization – this is a user with complete administrative privileges based on the “system” role access. 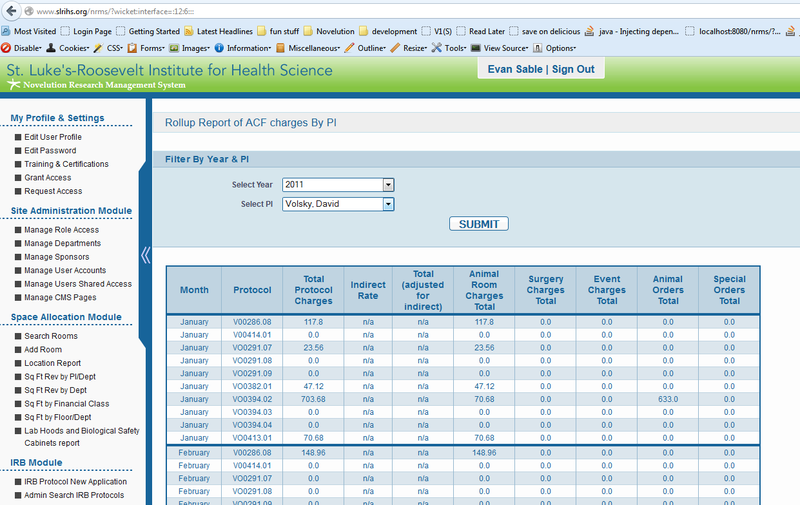 Sample page from the site administration module allowing administrator to view/edit departments in the form of a tree. Unique authorization module feature allowing logged-in users to Grant Access to other user accounts to work on their behalf (i.e. edit protocol records for which they are the PI). Also note the stripped down left-navigation links for this logged in PI user, who does not have administrative roles. Sample search page from the Grants/Contracts Module allowing administrator to apply multiple filters to the sponsored research search results, or to jump directly to a record based on associated fields. Sample budget year tab from the edit page for a Sponsored Research record in the Grants/Contracts Module. Users can manage multiple tabs for distinct years, as well as edit data fields in the "Main" tab which are common to all years. Sample IRB protocol application page from the IRB Module. Note the varied expandable/collapsible sections, each containing form fields for varied aspects of the protocol. In this screenshot, all the subsections are collapsed. Hitting the plus icon will expand a section - see the next screenshot for an example. Sample component of IRB protocol application page with 2 expandable/collapsible sections of the form expanded. The top section in this image, to manage research team members, involves its own sub-form with an ajax submission that updates the data table. The bottom section contains multiple file upload fields, including several "multiple-file" upload fields in which the user can browse and insert up to 10 files at a time to be associated with the given data field for the record. 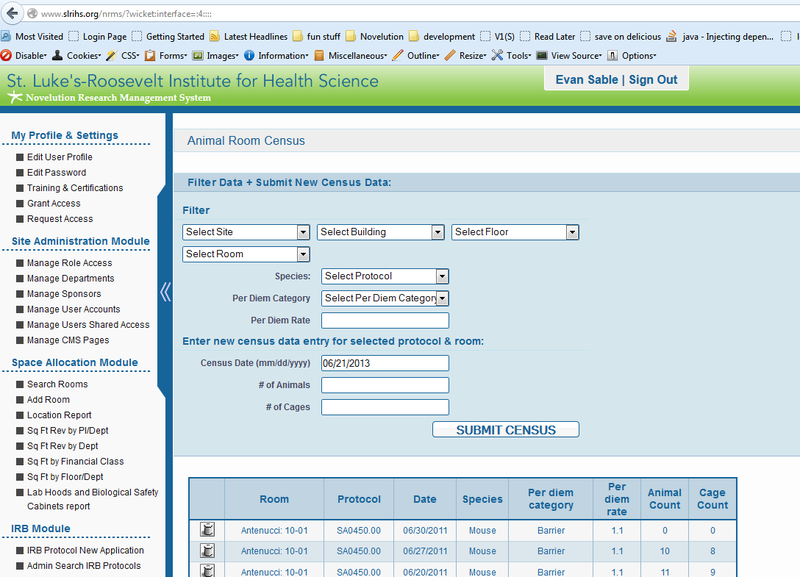 Sample page with form to submit animal census data, for combination of rooms and protocols, as well as options to filter reported display of census data history. Sample report aggregating different types of ACF charges by PI, for each of their protocols. Sample web form to request generation of IACUC Monthly Meeting Agenda, along with system generated Agenda file opened as a Word document. Sample search page to filter through rooms defined in the space allocation module based on various characteristics, with paginated results. Rooms in search results have clickable edit link to go to the edit form to manage data associated with the room in the system. Sample report aggregating by department and PI the total square feet assigned per building over a selected date range, along with pro-rated revenue for the PI and department for the period.